After a nice morning run along the beach at Broughty Ferry I was ready to visit Dundee. 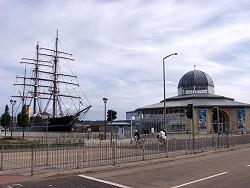 My first stop was the Discovery Point with the RRS Discovery. The exhibition gives an excellent overview of the history of the Royal Research Ship Discovery and its expedition to Antartica in 1901-1903. 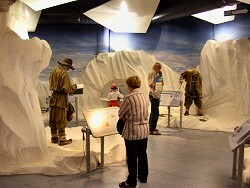 The exhibition has various multimedia shows to show how the ship was built, how the crew was assembled and what they did during the expedition. After the exhibition it continues on to the ship where several rooms are restored to their original state. 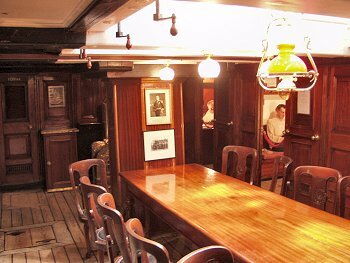 The wardroom with its adjoining individual cabins showed how the officers lived during the journey. 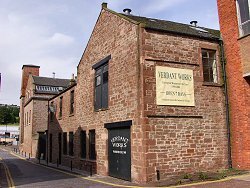 Only a short walk away is Verdant Works, the National Jute Textile Museum. 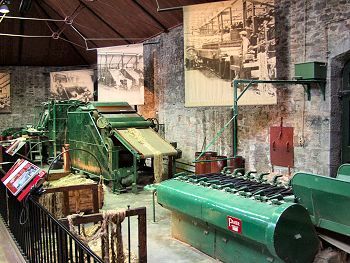 It gives an excellent overview of the history of the jute industry which employed 50,000 people in Dundee at its peak. Working textile machines show the whole process from start to finish while other exhibitions show the social impact of the growth and decline of this industry. Unfortunately there weren't many visitors when I was there, I think it deserves much more visitors than I saw. By now it was afternoon, time to make my way to St Andrews a short drive over the Tay Road Bridge. 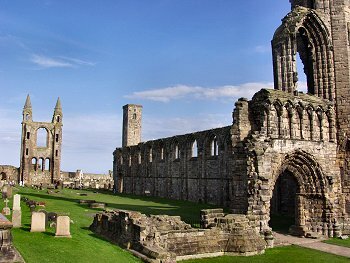 After arranging accommodation for the night my first stop was at St Andrews Cathedral. 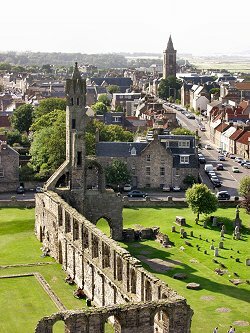 This was once the largest cathedral in Scotland, built from 1160 to 1318. After the struggles of the reformation it was left to ruin after 1559, as late as the 1820s stones were taken from it for local building projects. I also climbed the 157 steps to St Rule's Tower, from where I had a fantastic view over St Andrews and the ruins of the cathedral. 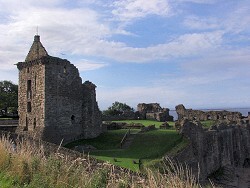 Just around the corner from the cathedral are the ruins of St Andrews Castle. There isn't that much to see in the ruins, the best preserved places are the "bottle dungeon" (a bottle shaped dungeon carved into the rock) and the countermine. 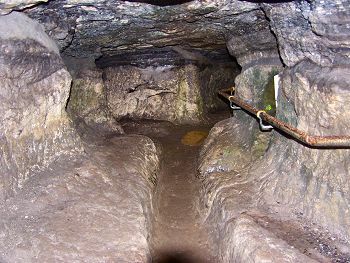 The countermine is one of the most interesting examples of medieval warfare: During a siege in 1546 the attackers were digging a mine to cause the walls to collapse. So the defenders dug a countermine to intercept the attackers and foil their plans, which they successfully did after three attempts to find the mine of the attackers. 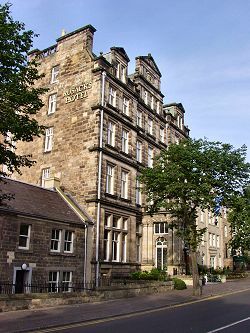 For the night I stayed in one of the best hotels possible for St Andrews: Rusacks Hotel right next to the 18th green of the Old Course. 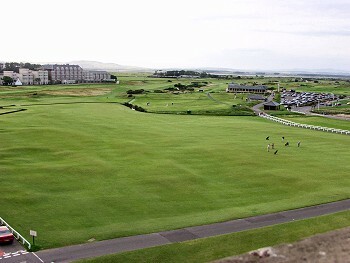 While my room didn't overlook the course I could still see the course from my bathroom. Dinner was at Ziggy's, a popular place full of rock'n'roll memorabilia.